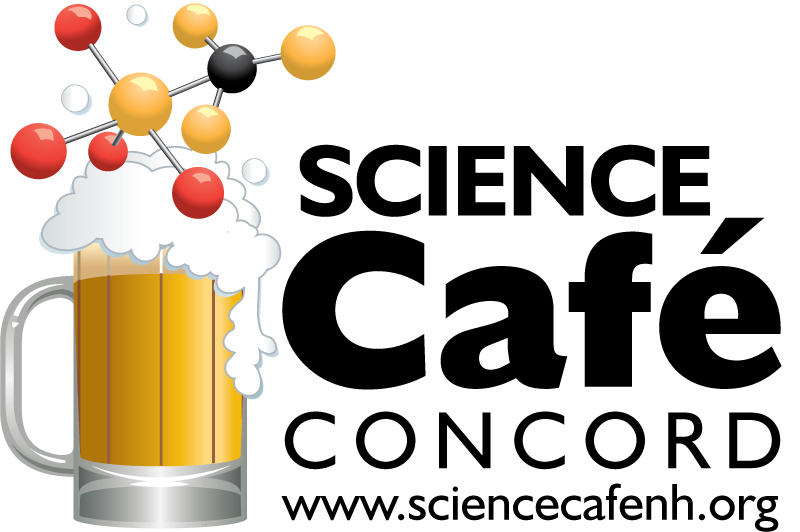 Join Science Cafe in Nashua or Concord at our next (free) event!Science Cafe NH | Join NH residents and area experts as we discuss current scientific issues in a comfortable and informal setting. 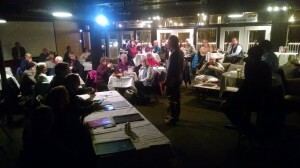 NASHUA: The Riverwalk Cafe in Nashua from 6 to 8 p.m. on the second Wednesday of the month. CONCORD: Makris Lobster and Steak Restaurant, 354 Sheep Davis Rd. (Rt. 106), 6-8 p.m., fourth Wednesday of the month. Note: Reservations are required – call 225-7665. 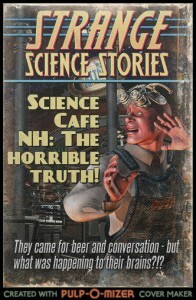 Stay connected via SCNH’s mailing list – send a “please sign me up” request to sciencecafenh@gmail.com. You may want to sign up for the free Granite Geek weekly newsletter: granitegeek.concordmonitor.com. Panelists: Peter Leach is a forensic archaeologist with Geophysical Survey Systems, Inc. of Nashua, manufacturers of ground penetrating radar (GPR) equipment. Peter has worked on projects across the country, in Europe and South America. Jessica Cofelice is a principal investigator at Independent Archaeological Consulting, in Portsmouth, an expert in bio/funerary archaeology and has worked on a broad range of projects throughout Maine, New Hampshire and Vermont. Tonya Largy is a consultant in the analysis of archaeobotanical and archaeofaunal materials from archaeological sites in the Northeastern United States. She has decades of experience preparing the reference collection of vertebrate skeletons for the Zooarchaeology Laboratory of the Peabody Museum, Harvard University. Gene co-owns the Nashua Farmer’s Exchange on Bridge Street with Judy Ratta-Harrington. He is a is a returning panelist to the Science Cafe Nashua and brings over 35 years of experience to our gardening discussions. Gene hold degrees in both Wildlife Biology and Entomology and is one of the Nashua Region’s ‘go-to experts’ when it comes to lawn, vegetable, and perennial gardening. Jonathan is a Field Specialist for Commercial Horticulture with UNH Cooperative Extension in Hillsborough County. He also teaches classes in horticulture, specializing in greenhouse management and greenhouse crop production, at the Thompson School at the University of New Hampshire. Jonathan was a grower for both wholesale and retail commercial greenhouses for 18 years prior to joining UNH. Cameron Bonsey, Coast of Maine, Portland, ME Cameron is the Director of Marketing for Coast of Maine Organic Products and has been with the company since 2007. A returning panelist to the Science Cafe Nashua, he’s our expert on the benefits that micro-brewed compost blends made from ocean by-products bring to our gardens. Be sure to ask him why your plants love ‘lobsta’! SCNH Concord, Oct. 2017, talking about cancer. March, Nashua: Forensic Science with Panelists: Tim Pilleri & Lance Reenstierna, Hosts of three popular true crime podcasts: ‘Missing Maura Murray’, ‘Crawlspace’, and ‘Empty Frames’, Mark Hastbacka, Special Agent, Dept of Justice (FBI), Dr. Elizabeth Karagosian, Forensics MD, Southern NH Medical Center, Emergency Services, Patrick Hannon & Robert Powers, Detective Sergeants, Nashua Police Dept, Criminal Investigation Unit; March, Concord: Genes, genealogy and cold cases – Panelists Kimberly Rumrill, Criminalist II with the New Hampshire State Police Forensic Laboratory; Albert “Buzz” Scherr, chair of International Criminal Law & Justice Program at UNH School of Law, who was featured in the “Bear Brook” podcast; Beth Wilkes, professor, Department of Natural Sciences at NHTI- Concord’s Community College. February, Nashua: Mating Behaviors – with panelists Lori LaPlante, Associate Professor of Biology at St Anselm College, Ammara Khan, Adjunct Professor of Life Science at CC System of NH, Michelle Beck, Assistant Professor of Biology at Rivier University and Anna Wallingford, Entomology Specialist at UNH Extension. January, Nashua: The Science of Tea – Panelists included: Brooks Firth Bard from MEM Tea Company of North Cambridge, MA, Darryl Parker, owner of Schoodacs Coffee & Tea in Warner, NH, and Sam Fox of A&E Roastery in Amherst, NH. November, Concord: Past Present and Future of Space Flight. Nathan Schwadron, professor of space plasma physics at UNH; Kristina Anne Lynch, Dartmouth College physicist specializing in the plasma physics of the auroral ionosphere. November, Nashua: Space, SETI and Little Green Men. 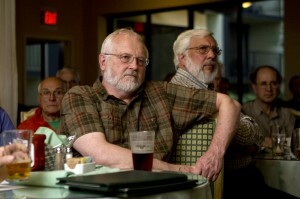 Johnny Gelsomini, an Educator in Physics, and Skip Crilly of the Green Bank Observatory in West Virginia. October, Nashua: Alzheimers and Dementia. Kelsey Gosselin, Manager, Medical and Scientific Research Engagement, The Alzheimers Association, Pamela Deres Manager of St. Joseph’s Hospital Alzheimer’s and Dementia Resource Center and Wendy Sage-Matsis, Director of Community Relations at Bridges by EPOCH September, Nashua: STEM Education. Amanda Bastoni, CTE Director forNashua School District, Ken St. Hilaire, FIRST Senior Mentor, and Jocelyn Fraga Muller, Assistant Professor of Biology at Rivier University. September, Concord: All about the Ig Nobels. Marc Abrahams, who created the science parody event in Boston July, Nashua: Art and science of gardening. Gene Harrington, Nashua Farmer’s Exchange and Cameron Bonsey, Coast of Maine, Dave McConville, Grow Nashua, Paul Shea, Certified Master Gardner and Loretta Jackson with the Merrimack Valley Bee Keepers Association. June, Concord: Medical marijuana. Karen Van Gundy, Professor in the UNH Dept of Sociology and co-author of “Marijuana: Examining the Facts” and representatives from Prime, an Alternative Treatment Center in Merrimack, and Sanctuary, an ATC in Hanover. June, Nashua:Audiology, Hearing Loss and Cochlear Implants. Dianna Lindholm, teacher; Rachel Parkington, educational audiologist; Jenifer Morris, teacher; and Francene Pelletier, teacher and recipient of a cochlear implant. May, Concord: Reinventing recycling. Michael Durfor, Executive Director of Northeast Resource Recovery Association. Michael Nork, environmental analyst with the state Solid Waste Management Bureau. Richard Lee, public works director, town of New London. May, Nashua: Medical Marijuana. Karen Van Gundy, Professor in the UNH Dept of Sociology and co-author of “Marijuana: Examining the Facts”, Michael Holt of NH Dept of Health and Human Services and member of the Therapeutic Use of Cannabis Advisory Council; Dr. Corey Burchman, Anesthesiologist and Advisor to Prime Alternative Treatment Center. April, Concord: How ‘green’ is biomass energy: John Gunn, UNH asst. professor of forestry and resource management; Robert Perschel, Executive Director of the New England Forestry Foundation. April, Nashua: Chocolate! Tom Reed, Head Chocolatier of Van Otis Chocolate, and Paula Burdick of Jouvay Chocolate and also the founder of Burdick Chocolate March, Concord: Alternative voting methods. Jameson Quinn, Center for Election Science; Jason Sorens, Dartmouth lecturer; Billy Jackson, Voter Choice Massachusetts; Daniel McGuire, N.H. Liberty Alliance. 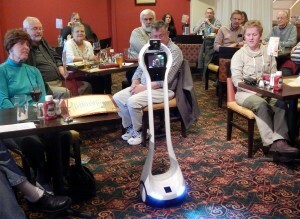 March, Nashua: Smart buildings, home automation. Gary Hubbard of Leading Edge design Group and Josh Chace of Comcast. February, Concord: Making buildings more efficient. Kistin Bahny of TRC Solutions, who has 9 years of experience in energy consulting; Margaret Dillon, independent building and energy consultant; Kate Peters of Eversource Energy oversees planning for the NHSaves rebate and incentive programs. 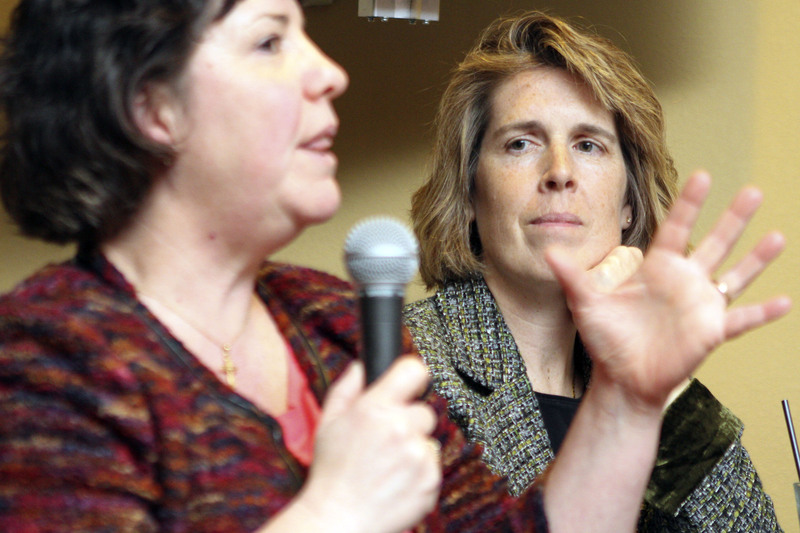 February, Nashua: The flu - Dr. Melissa Duxbury, board certified family medicine doctor in Hudson; Flavia Martin, RN, is a public health nurse serving the City of Nashua. ; Dr. Susan Barbaro is a microbiologist and professor at Rivier University. January, Concord: The science of parenting – Brenda Quinn, independent clinical social worker; Jessica Lahey, author of “The Gift of Failure: How Parents Learn To Let Go So Their Children Can Succeed.” KJ Dell’Antoniam former writer and editor of the N.Y. Times’ Motherlode blog January, Nashua: Tissue engineering in NH – Tom Bollenbach and Richard McFarland of ARMI/BioFabUSA in Manchester, NH. November, Nashua: Narcan and The Drug Crisis. How does it work? Does it really help? - Lisa Vasquez, Substance Misuse Prevention Coordinator at Nashua Division of Public Health and Community Services. November, Concord: The Power Grid; What’s in store? - Michael Mooiman, associated professor at Franklin Pierce University and long-time observer of NH energy system. Chris Skoglund, Climate & Energy Program Manager with the NH Department of Environmental Services (NHDES). James Brennan, director of finance at the New Hampshire Office of Consumer Advocate. October, Concord: Cancer - Sarah Eck, whose PhD degree in Biochemistry focused on breast cancer cells; Brian Barth, Assistant Professor of Pharmacology at UNH; Dr. Brian Knab, Radiation Treatment and Oncology for Elliot Health System. 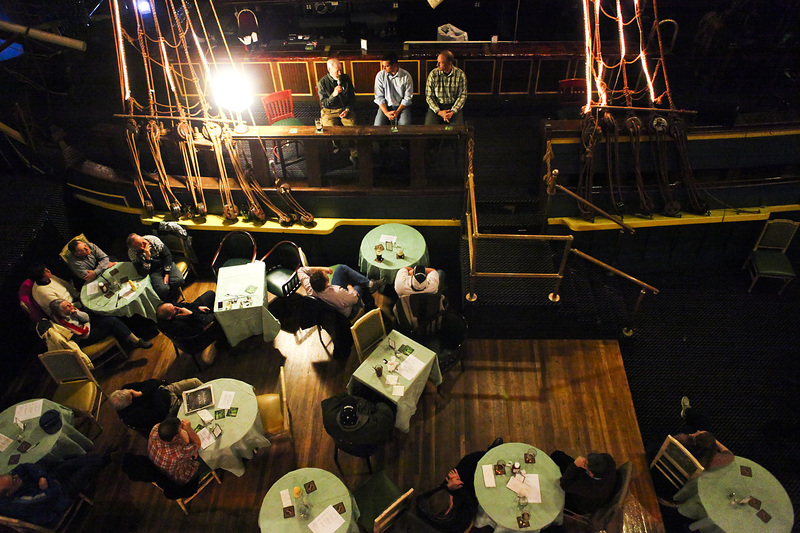 October, Nashua: (the first in Riverwalk Cafe): Prosthetics and Adaptive Technologies. Panelists included Dr. Michael Kneeland of UMass Medical School, Matt Albuquerque of Next Steps Bionics, and Wendy Katsekas, an amputee. September, Concord: ARMI, renegerative medicine coming to Manchester - Chief Regulatory Officer Richard McFarland and Chief Technology Officer Tom Bollenbach of ARMI. September, Nashua: The Science of Coffee – Richard Trubey and Raul Raudales of the MesoAmerican Development Institute at UMass Lowell, Chemistry and Material Science Professor Glen Miller of UNH, and Emeran Landmaid, Owner of A&E Roastery. June, Concord: Citizen Science - Sara Steiner, coordinator Volunteer Lake Assessment Program, NH Department of Environmental Science; Malin Clyde, UNH Coop Extension Stewardship Network director. 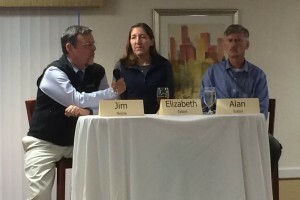 May, Nashua: Living with Climate Change - Professors Larry Hamilton and Liz Burakowski of UNH and Mike Bailey of the US Fish and Wildlife Service. April, Concord: Composting - UNH Cooperative Master Gardener Bonnie Ensinger; Joan O’Connor of Joan’s Famous Composting Worms in Henniker ; James Meinecke, farmer in chief at Lewis Farm, Concord. March, Concord: N.H. Demographics & the “silver tsunami” - Ken Johnson, Carsey School of Public Policy at UNH; Ken Gallager, senior planner with the New Hampshire Office of Energy and Planning. March, Nashua: Robots. Fred Alibozek of iRobot, Joshua Rosen of GreenSight Agronomics, and Alexander Malin and Luke Broyer of Omron Adept Technologies. Feb., Concord: Seasonal Affective Disorder. Meghan Butcher, a psychology intern at Concord Hospital Family Healing; Wayne Castro clinician at Riverbend Community Mental Health in Concord. Feb., Nashua: SAD. Carlos Martín Cinto, Licensed Clinical Mental Health Counselor with Catholic Charities NH in Nashua; Marc Sadowsky, a psychiatrist from Nashua; and Barb Tremlett, founder of The Holistic Self Care Center in Nashua. Jan., Concord: Electric cars. Rebecca Ohler of NH Department of Environmental Services and longtime electric-vehicle advocate; Mike Mercer, technical service director for Banks Chevrolet, which is introducing the all-electric Bolt this year. Jan., Nashua: Cybersecurity. Carl Levine, Senior Technical Evangelist for NS1, a new managed DNS service firm in N.H.; Timothy Winters, executive in software and IP networking at the UNH Interoperability Lab, which has started Internet of Things testing to tackle DDOS issues. Nov. 15, Concord: “3-D printing – is it living up to its promise?”. Panelists include representative from SolidScape in Merrimack, which makes and sells 3-D printers; Jeff Hapgood of Technology Education Concepts in Concord; plus a representative of Manchester Makerspace. Nov.2, Nashua: “New Hampshire’s Drought.” Brandon Kernon, NH Department of Environmental Services who oversees the state’s drought response; Roger Skillings of Skillings and Sons, well-drilling from in Hollis; Doug Webster, meteorologist and weather columnist for the Telegraph. October 18, Concord: “Indoor agriculture – can technology turn farming into a year-round business in NH?” Lef-Farms, which is building a huge indoor facility in Loudon; Todd Guerdat UNH professor of agriculture and part of new UNH Aquaculture Farming Project. October 5, Nashua: “Big Data” - Eric McCall, director of engineering for DataGravity Inc. in Nashua; HaiYing Wang, assistant professor of mathematics at UNH; Martin Margala, Chair of Electrical and Computer Engineering Dept. at UMass-Lowell. September, Nashua and Concord: “Coping with Climate Change” – Rhett Lamb, city planner for Keene; Trevor Hardy of Brookdale Farms in Hollis; Chuck Souther of Apple Hill Farm in Concord; Sherry Godlewski, environmental program manager with NH Department of Environmental Services June 29, Nashua (special event): There’s an App For That – a look at the world of smartphone apps; co-sponsored by NashuaHUB. June 15, Nashua: Local Hydropower – a look at small-scale water-powered electricity in Nashua and elsewhere. Panelists included Madeleine Mineau of the City of Nashua, Michael Bailey of the US Fish and Wildlife Service, and Engineer John Lavigne of HL Turner helped attendees fathom the ins and outs of hydro power! June 8, Concord (special event): What Is This Thing Called Math? 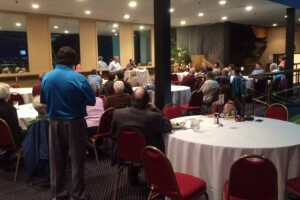 Discussion with Dave Brooks, Science Cafe Concord moderator, and Ian Underwood of Ask Dr. Math, following a screening of the move “The Man Who Knew Infinity” at Red River Theaters, Concord. June 7, Concord: The science of brewing. Otto Kuhn, senior brewmaster at Anheuser-Busch‘s Merrimack brewery; Christopher Shea, head brewer at Henniker Brewing Co.; and Ed Ramshaw, president of Concord Area Homebrewers. June 6, Gilford: Special session on “Opioids, Heroin and Abuse” Lakes Region attendees heard from Dr. Paul Racicot, Pharmacist Peter Grasso, and Paramedic Richard Oberman on the dangers and realities of the opioid crisis in the Laconia area. May 18, Nashua: Radiation and Terrorism The topic covered radioactive materials, terrorism, terrorists and the threat the combination poses to New Hampshire. What is the nature of the threat? Current methods of detecting, tracking and containing nuclear materials? What will we need in the future? 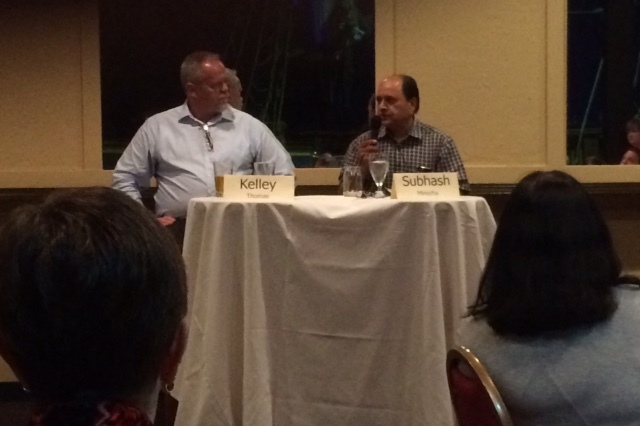 Panelists included Dr. Sukesh Aghara and Lt Col Greg d’Arbonne (ret.). May 3, Concord: Lyme Disease. 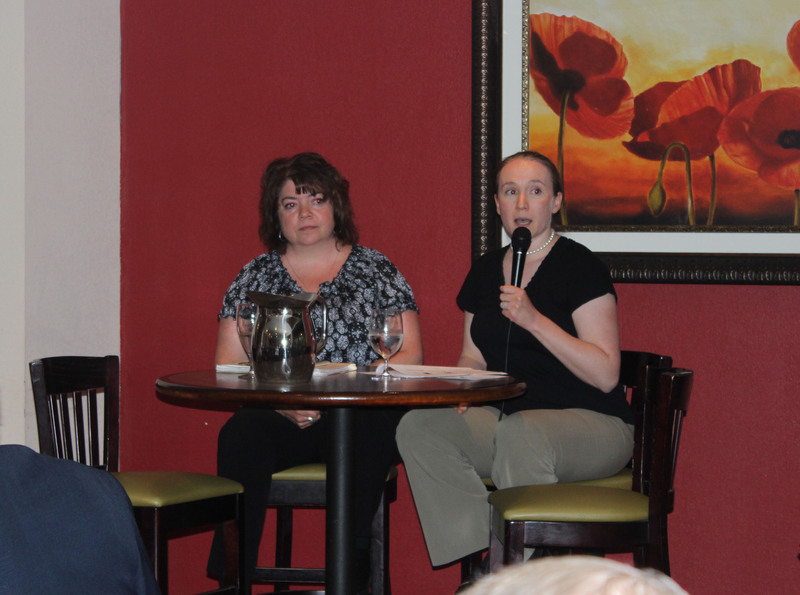 Panelists: Dr. Lynn Durand of Family Tree Health Care. Alan Eaton of UNH, entomologist. April 20, Nashua: CRISPR and gene therapy. Panelists Dr. Subhash Minocha and Dr. Kelley Thomas discussed the latest in gene editing technologies and what this might mean for the future of disease and designer babies. April 5 Concord: Self-driving cars – Sean Smith, Computer Science professor and Director of Institute for Security, Technology and Society at Dartmouth College; Andrew Kun, professor of Electrical Engineering at UNH; Joe Cunningham, professor of the Robotics and Automation Engineering Technology program at NHTI. March 1, Concord: CRISPR and the revolution in gene editing. Panelists: Subhash Minocha and Thomas Davis, professors of Plant Biology and Genetics at UNH. Feb. 17, Nashua: Heroin, opioids and beyond. Pharmacist Vahrij Manoukian of Hollis Pharmacy; Chris Shambarger, liaison to the NH State Police; Paramedic Patty Stolarz of AMR Nashua; Dr. Abigail Zavod of Dartmouth Hitchcock Nashua. Feb. 2, Concord: Bitcoin & Beyond. Panelists include JJ Schlessinger who co-produces Neocash Radio, a podcast focused on alternative currencies, and Andrew Curioso, Chief Technology Officer of GoCoin, a leader in blockchain payments that recently merged with New Hampshire based Ziftr. Jan. 20, Nashua: Big power in New Hampshire. Panelists include Richard Labrecque, Manager of Distributed Generation for Eversource Energy, and Craig Cassarino of Leonardo Technologies, Inc.
Jan. 12, Concord: The science of heroin, opioids and addiction. Panelists included state medical examiner Thomas Andrew, Concord Fire Chief Dan Andrus, Dr. Molly Rossingol and Concord Hospitals’ Monica Edgar. Story here. Nov. 18: Solar power. Mark Weissflog, president, KW Management of Nashua, a long-time solar installation firm. Daniel Voss, power consultant ffom Bonfire Power in Lexington, Mass. Jonathan Gregory, New Hampshire manager with ReVision Energy, a New Hampshire-based solar firm. Oct. 21: The science of polling – The math, the logistics, the decision-making behind the creation of polls. Dennis Delay, economist at the N.H. Center for Public Policy, who has overseen political and economic polls for a long time. Zachery Azem, research associate at the University of New Hampshire Survey Center since 2013, who has managed numerous statewide and nationwide polls. Sept. 16: Fishing and fisheries in New Hampshire: Changing climate, changing markets, changing obstacles. Gabriella Bradt and Erik Chapman, marine fisheries specialists from New Hampshire Sea Grant, UNH Cooperative Extension. 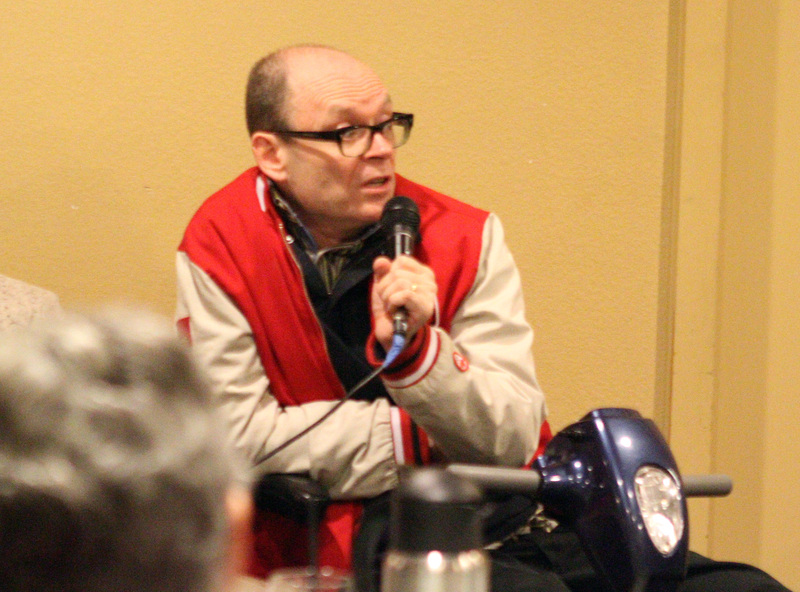 Michael Bailey, asst. project leader US Fish and Wildlife Service, at the Nashua National Fish Hatchery. June 17: Probiotics and gut health. Liz Whalen RD, LD; Clinical Nutrition Manager, and Rebekah Donelan RD, LD; Clinical Inpatient Dietitian from St. Joseph Hospital in Nashua. May 20: Trains – an old technology that keeps getting newer. Eric DiVirgilio, civil engineer, project manager for HNTB consultants, who has worked for 15 years in design and implementation of rauil expansion and upgrade throughout New England. Bill Mosher of Nashua, who worked in railroads for 25 years. (A last-minute standin) April 15: Who lived here before Europeans – and how do we know? Richard Boisvert, N.H. state archaeologist, will be one panelist, to talk about the anthropology and archaeology in the Granite State, and the peoples who were here after the glaciers left and before the Mayflower landed. Linda Feurderer, president of the New Hampshire Archeological Society. March 18: Why are roads built where they are? Ryan Friedman, Senior GIS Planner for the Nashua Regional Planning Commission, deals with “travel demand models” and how they are used to make decisions about expanding infrastructure. Mark Connors, regional planner for Nashua Regional Planninc Commission, provide an overview of the planning process and how projects move from ideas through planning to construction. Feb. 18: The science of sugar: Stephanie Ballentine is a family nurse practitioner working currently in an internal medicine office of St. Joseph Hospital in Nashua. Gale Carey is a professor in the Department of Molecular, Cellular and Biomedical Sciences at UNH. Jan. 21: Geothermal energy in New Hampshire. “Heat exchange” is a more accurate term, but either way it can cut energy usage. How does it work, and is it worth it? Roger Skilling, co-owner of Skilling & Sons, which has been drilling geothermal wells in New Hampshire and elsewhere since 1981. Chip Crocetti, senior vice president of Sanborn Head & Associates in Concord. Martin Orio, president of New England Geothermal Professionals Association (www.NEGPA.org), and vice president of NortheastGeo.com / Water Energy Distributors Inc., which has been in the business since 1978. Nov. 19: Medical screening – Are we doing too much of it? Questions are being raised about whether frequent and early screening for breast cancer and prostate cancer might do more harm than good. Dr. Jose Montero, head of the NH Department of Public Health Services Dr. Sanders Burstein, family physician and geriatrician, medical director at Dartmouth-Hitchcock Nashua and co-directer of Honoring Care Decisions, a new program to promote and improve Advance Care Planning at Dartmouth-Hitchcock and local communities. Dr. Salvatore Vella, internist with Southern New Hampshire Health Services Oct. 15: Flexible and printed electronics: Craig Amiento, professor of electrical and computer engineering at UMass-Lowell; director, Center for Photonics, Electromagnetics and Nanoelectronics; and co-director the brand new Raytheon-UMass Lowell Research Institute. Joe Junze is the president of SI2 Technologies of North Billerica, Mass., a small business in the flex electronics area. Chris McCarroll is a research scientist in Director of Engineering in Raytheon’s Integrated Defense Systems, the Director of Technology for Above Water Sensors (AWS) in Seapower Capability. Sept. 19: The science of marijuana: Dr. Alan Budney, professor of psychiatry at Geisel School of Medicine at Dartmouth College, and an investigator at the Center for Technology and Behavioral Health at the school. Dr. Staci Gruber, director of the Cognitive and Clinical Neuroimaging Core at McLean Hospital’s Brain Imaging Center and an associate professor of psychiatry at Harvard Medical School. June 18: Fluoridation in public water systems: Panelists: Dr. Sarah Finne, dentist, from New Hampshire Dental Society. 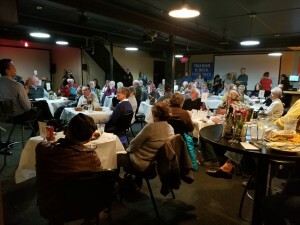 May 21: Organic Gardeing: Does it make sense in NH? Roger Swain, known from his many years as host of “The Victory Garden” on PBS. Margaret Hagen, UNH Cooperative Extension educator and gardening writer and newspaper columnist. April 16: Telemedicine: Promise & problems of doctoring from afar. Lisa Snow RN, who has 32 years of experience in health care, including the last 6 years as Telehealth coordinator of Home Health & Hospice Care in Merrimack. Ned Semonite, head of product development and marketing at VGo, a Nashua firm that makes “telepresence” robots used in telemedicine and other fields. George Fryburg, Director of ConnectNH (formerly the Granite State Distance Learning Network) at UNH. March 19: Bitcoin, What the heck is it? Prof. Michael Carter, chairman of UMass Lowell’s Economics Department. His research interests are monetary policy, and risk and globalization of financial markets. Mike Segal is a Manchester-based software developer specializing in cryptography and machine learning algorithms. Andrew Stone is a software architect who has been a Bitcoin investor since early 2012. Feb. 19: Allergies: it seems like they’re getting worse; but are they really? Dr. Amit Kumar of Southern New Hampshire Asthma & Allergy. Dr. William Siroty of Nashua Medical Group. An authority on allergy and immunology for over 20 years, He is Board Certified in Internal Medicine and Allergy-Immunology. 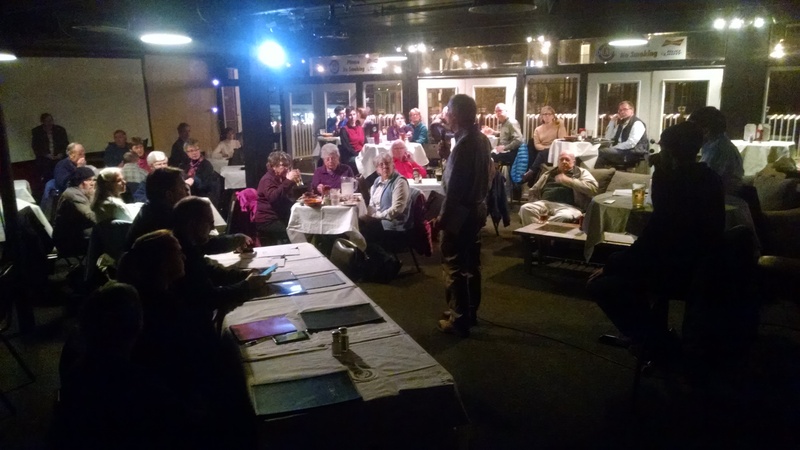 Jan. 15, 2014 – Electric cars: Do they make sense in New Hampshire? Dolores Rebolledo, coordinator of Granite State Clean Cities Coalition, a national program supported by the US Dept of Energy (DOE). Watson Collins, manager of Research and Business Development for the Northeast Utilities system (PSNH’s parent company). Steve Ncala, a product specialist with Peters Nissan in Nashua who specializes in selling the electric Nissan Leaf; he has sold about 80 percent of the chain’s electric car. Nov. 20 – Multiple sclerosis: Why does New England have such a high incidence? Dr. Donald McDonah - A family physician, board certified in Family Medicine and Hospice and Palliative Medicine, at St. Joseph Healthcare. A Nashua resident, with wife Cathy and 3 children, he was diagnosed with Multiple Sclerosis about 30 years ago. Laura Gifford – A kindergarten teacher in Manchester, diagnosed with MS on Sept. 2009. 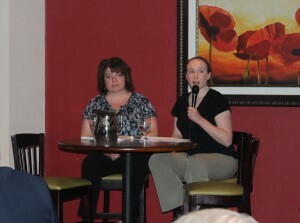 Allyssa Thompson – Community Program Manager in New Hampshire at the National MS Society, Greater New England Chapter. Oct. 16 The science of genetically modified organisms Richard Parent has taught biotech at the Applied Technology Center in Milford for 12 years, where kids work with DNA the way their parents dissected frogs. Mindy Dopler-Nelson, professor of Clinical Laboratory & Nutritional Sciences at UMass-Lowell. Joel Stake, biology professor at Rivier University in Nashua Thanks to a donation from Manchester’s Dyn Inc., we now have wireless microphones – no more watching the moderator trip over cords! Sept. 18 – Aquaponics, growing vegetables in water over tanks of fish. Anthony Eugenio, Green Harvest Hydroponics, which specializes in commercial and residential gardening supplies, including hydropponics and aquaponics. Mike Griffin, Aquaponics Farmer, Jessica Normand, UNH-Manchester student, a Biological Sciences major doing research into ways to apply aquaponics in the Northeast. June 18 – Flying Robots: Autonomous aerial vehicles (drones!) at home and in business. (Thanks to Gordon Jackson of Nashua for sitting in to replace a missing panelist and give us the hobbyist perspective.) Jason Walker, lead roboticist and director of operations for CyPhy Works in Danvers, Mass. , which makes the Persistent Aerial Reconnaisance and Communication tethered drone, among other things. 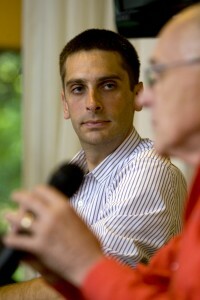 Nicholas Kirsch, assistant professor of electrical and computer engineering at UNH. May 15 - Invisible Wounds: Post-Traumatic Stress Disorder and brain injuries, in N.H. veterans and others, Dr. Jim Whitlock is a rehabilitative neurologist, director of the Brain Injury program and Chief Medical Officer at Northeast Rehabilitation Heath Network in Salem, NH. Terrie Raposo is an independent clinical social worker, employed as a civilian case manager for the NH Army National Guard Office of the State Surgeon, part of a team responsible for the medical and behavioral health readiness of soldiers in multiple deployment cycles. Lt. Col. Stephanie Riley of the New Hampshire Army National Guard is the state’s Occupational Health Nurse, in which she is a voice for both the Army and Air National Guards on state committees. April 17: “Cats or catastrophes?” Domestic cats are marvelous hunters, which can be a problem for birds and wildlife that they prey on. Brendan Clifford is a Wildlife Biologist with the Nongame and Endangered Wildlife Program of the New Hampshire Fish and Game Department. Anne Richards is a feline veterinarian who practices at The Cat Doctor in Bedford, Mass., and Nashua. Worked with cats exclusively since graduation in 2001. Pamela Hunt is senior biologist for aviation conservation with New Hampshire Audubon Society. March 20: “Mosquitoes vs. 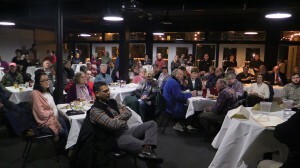 Humans: West Nile, EEE and the future of mosquito-carried disease in New Hampshire” Abigail A. Mathewson DVM, surveillance epidemiology program manager and and acting State Public Health Veterinarian, New Hampshire Division of Public Health Services. Heidi Peek, health officer and manager of the public health department for the city of Nashua. She has overseen the city’s mosquito control program since the year 2000. Gary Nielsen, entomologist and director of training for JP Pest Services in Milford. February 20: “The Science of Brewing” - At least 100 people packed the funky Bounty Room, with the panelists sitting on the full-sized pirate ship to answer question, as shown above. January 2013: “3-D printing” with the MakeIt Lab folks, who brought a printer with them for a demonstration. * November 2012: “Dark Skies and light pollution.” Presented along with the McAuliffe-Shepard Discovery Center. 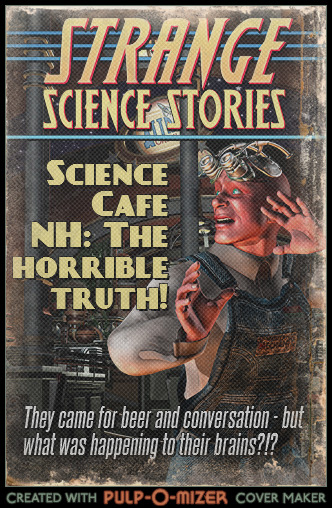 October 2012: “The science of concussions, in youth sports and daily life.” This cafe was part of a six-day series of stories on the topic by The Telegraph of Nashua, titled Broken Athletes.